I feel like this month, more so than most months, is chock-full of outfit necessities. Whether it be a black-tie ball or just a pre-Derby event, it’s time to start shopping or shopping in your closet, whatever works for you. I also need to fire a warning shot that Derby is a short time away, so now is the time to start thinking about your outfit for all the festivities that week. (This coming from the girl that changes her mind on her outfit every year with T-20 minutes before we have to be there). After seeing Jennifer Lawrence wear a metallic gold dress to the opening of the Hunger Games in Hollywood, I am of the persuasion that everyone looks good in metallic. This dress is jersey, which means it is comfortable and flattering and you probably won’t have to be playing any Hunger Games to fit into it. Jersey metallic gown in Black Gold by Nicole Miller. Available at Rodeo Drive. One of the premier balls in the state is the Kentucky Derby Museum Gala. Every year that I have attended, I have been in awe of the dresses. So, if you are going to this one, you are going to have to bring your A game. I suggest color or interesting detail. This first dress is a beautiful shade of apricot and drapes nicely. Apricot chiffon gown by Carmen Marc Valvo, available at Rodeo Drive. This dress by Nicole Miller is a head-turner. The back has material that drapes over the waistline and is only connected by a clasp at the back of the neck. The skirt portion is intricate sequin pattern, almost looks like python. Printed grey sequin gown by Nicole Miller. Available at Rodeo Drive. This luncheon is the kick-off to all the Derby Festival events and it is always fun. Consider it the pep-rally before the big game. Most people come from work, so feel free to wear your business suit. Or if you are feeling more colorful, a cute frock like this green and white Milly will do just fine. Oh, and just a note to the ladies, Erin Andrews is the keynote speaker, so this luncheon is going to be packed (with men). Dress by Milly, available at Clodhoppers. No I’m not crazy for putting a dress into this category. Who knows what the weather is going to be like for this event? We’ve seen the fireworks in 30 degrees, rain, and burning hot. Considering how hot it is now, I bet it will be hot for this day. So, wear a lightweight dress and your comfy sandals or flip flops. Now if it’s cold, just put your jeans and windbreaker on and call it a day (and a night). If you are fortunate enough to see the fireworks from indoors, this is a perfect option as well. 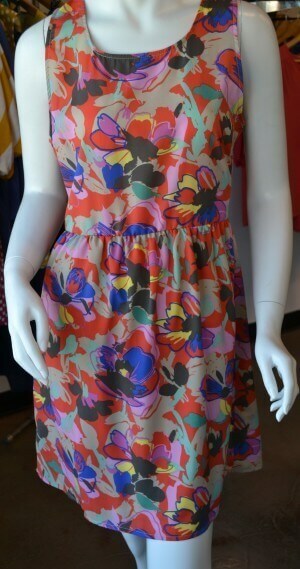 Spring Flower Dress by Everly. Available at Chartreuse. One shoulder printed dress by Milly. Available at Clodhoppers. Suzi Chin color-block dress and W&M Fabric Necklace Pearl Drop. Available at Serendipity Boutique. Dolce Vita dress and Golden Stella necklace. Available at Collections in Westport Village. Don’t forget about the Friends of StyleBlueprint Sale on Thursday April 19-20. There will be lots of dresses, Derby hats, shoes, jewelry, accessories and more. I am accepting consignments now; I need the “Best of Your Best” to make this a success. The Early Bird party is Thursday night, with all ticket proceeds going to Blessings in a Backpack. Please read here for more information and email me by clicking here ([email protected]) if you wish to consign.